The American Library Association’s digital-literacy task force defines digital literacy as “the ability to use information and communication technologies to find, evaluate, create, and communicate information, requiring both cognitive and technical skills.” Digital literacy is an important skill that incorporates many Common Core Standards. As an Elementary Technology Teacher, I am always looking for ways to creatively incorporate content standards and digital literacy into my lessons. Immersive stories engage students in learning content and improve students skills in digital literacy, reading informational text, and writing. Creating virtual tours with ThingLink is an ideal medium for developing digital literacy skills and addressing Common Core reading and writing standards. Fourth graders study Colorado history in their social studies classes. 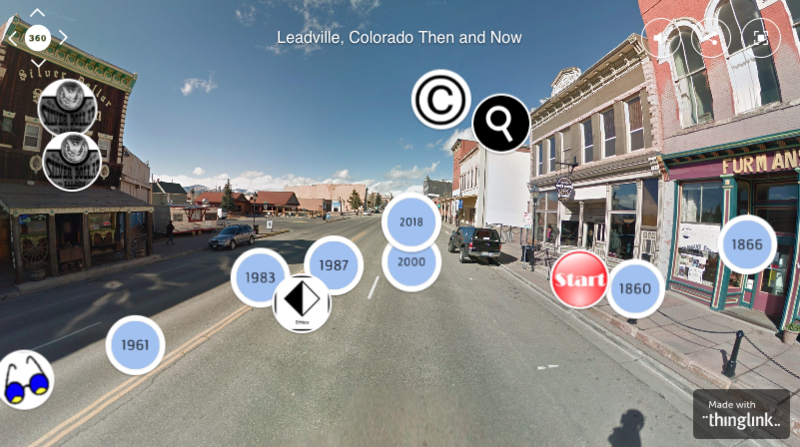 As an extension of these studies, students in my technology classes will explore a ThingLink I created on Leadville (below) in order to understand how Leadville (and much of Colorado) has changed over time. This ThingLink also serves as a model for the projects students will create later in the unit. I have decided to use the Icons of Depth and Complexity as a tool to ask students to reflect as they explore the tour I created and to help students to identify important historical points as they create their own tours. This will help students go beyond surface level understanding and think more critically. As I created my ThingLink tour, I used a story map to help organize my thinking. After exploring and discussing the Leadville ThingLink 360°, I plan to have students select a city or town in Colorado to research. They will research their selected city or town, evaluating many digital resources and integrating information from multiple sources in order to write about how their town has changed over time. Students will use primary source photos as the basis for their analysis of how their town has changed over time. Students will use the same story map template as they plan their ThingLink. Specifically, students will be asked to examine primary source photos to infer details about various time periods. They will then be asked to sequence their photos to see trends and understand how their city or town had changed over time. I am excited to see how using these additional lenses helps students to think critically as they create their own ThingLink tour of a Colorado town. To create their ThingLink, students will either use Google Street View to find images or take their own 360 photos of their town using the Ricoh Theta cameras we were able to purchase through grants from Donors Choose, CenturyLink and Innovative Education Colorado. After uploading their 360° image to ThingLink, students will create tags with primary source images of their town in different decades. With the recent update to ThingLink students are now able to record their own audio. Students will create audio narration to include in their virtual tours. Creating their own project addresses additional writing and speaking standards. In addition to the Common Core reading, writing, and speaking standards, this project also addressed the Colorado State Standards for History and 21st Century Skills and Readiness. As a teacher, I love tools that I can use to create interactive lessons for students and also allow students to create their own content. ThingLink is one of my favorite tools for this type of thinking. I’ve used ThingLink with third grade students as they explore Colorado habitats and life zones and with fifth grade as students study the human body. ThingLink is amazing for helping students to explore time and place as they develop reading, writing, and speaking skills needed by Common Core Standards. Michelle Eckstein is a ThingLink Certified Educator and Elementary Technology Teacher at Peak to Peak Charter Schoo, in Lafayette, Colorado. 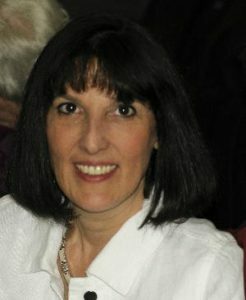 She has been in teaching elementary schools for over 10 years and has a Masters in Gifted Education from the University of Connecticut and endorsements in elementary education, gifted education, and instructional technology. Michelle loves seeing students authentically engaged when they are creating with technology. Through project-based learning, students used 360 cameras, ThingLink 360/VR and a variety of multimedia tools to create virtual reality tours of Colorado. Students built knowledge by actively exploring actual ecosystems and discovering the landforms, animals, and plants that live in the -ecosystem. They then used ThingLink 360/VR to show what they had learned. ThingLink 360/VR was the perfect tool for both delivering content and having students show what they had learned.